The tadpole has turned into a frog!!! La Gr@not@ (The Frog in Catalan) has just been registered as a company in Germany and has been assigned its first batch of 100 ISBNs! Those entrants chosen [by our panel of rank amateurs on a strictly “Well, we like it!” basis] will be assigned 2 [European standard size A5] pages (facing each other) to fill. You may fill both pages with writing (one longer or 2 or more shorter pieces, e.g. short poems), both with illustrations, illustrations on one page and writing on the other, or illustrations and writing all over the place. It's entirely up to you. This is Wonderland. Your several pieces could relate to each other (for example a drawing that illustrates a short story) or be entirely independent of each other... as long as they all relate to Alice’s Adventures In Wonderland. There will be NO other editing, so you [and your friends] should proofread your submission yourselves: we will consider that all typos are intentional. And if you choose to write a 200,000 word treatise on the subject – and we deem it worthy – it will be PhotoShopped® to fit the space assigned (so that nobody will be able to read a single word of it... but YOU and WE will know that it’s the real goods). If you ask us (nicely) to do so, we could ALSO place your entries on either side of the same sheet of paper, so that you could introduce something or other, then SURPRISE the readers when they turn the page. c) both, side by side. All entries must be submitted in digital form, as attachment to e-mails sent to aliceANDI@la-granota.com (Make sure that you remove all CAPITAL LETTERS from that address before sending [remove: do not convert into lower-case]: this is our tactic to avoid Internet-crawling computer-generated spam filling up our inbox. And DON’T forget the hyphen!!!) Please state your age (not just "over 21": we'd like to give readers an accurate idea of the range of ages of the contributors) in the main body of the e-mail. Written contributions can be in any form readable by OLD versions of Word® (i.e. NOT .docx) or by Word Perfect® (or – in the case of children – they COULD be scanned images of handwriting in JPG format). All graphics should be in JPG format. If you’re computer-imaging literate, please make sure that they’re 300pixels per inch and height 21cm (8.268in) x width 14.8cm (5.827in) [i.e. A5] or less. (If you aren't computer-imaging literate, don't worry: we are.) No PDFs at this time. an invitation to our launch party + a 10% discount on all La Gr@not@ publications ordered this year for ALL who enter, regardless of whether their submission is chosen for publication. We’re holding the launching party on Sunday, the 16th of August, 2015, in the grounds of Schloss Freudenberg – one of our personal Wonderlands – and in our opinion it beats EuroDisney® into a cocked hat as far as attractions and activities goes, and it’s MUCH cheaper (including a “no questions asked, admission money back if not completely satisfied” guarantee, of which we’re sure that only jokers or the VERY hard-up have ever taken advantage). Entry to the grounds [where our founder’s favourite 2 of all the attractions are to be found] is, in any case, always free; and we’ll be asking for a group rate + guide(s) for entry into the castle. Even if you can’t make it to the party, we’d like to point out that this is one place that you should plan to visit at SOME point in your life... so why not now? Attendance at the launch party implies your agreement to permit photographic and video images of yourselves to be published on Internet and elsewhere, so make sure that you behave yourselves! We will pay 50% of the entry price to the castle for the first 40 people who write to us to confirm that they will be attending. (Please tell us how many are in your group, with ages.) We will pay for the guided tour (very interesting!) for the next 20. Taking part in this competition implies acceptance of this decision. In order to give you time to put on your creative caps, we are announcing this competition NOW, before all the details [possible entertainment at the party, publication date] have been worked out. Deadline for entries (straight out of the White Rabbit’s watch pocket) is the... hmmm... 20th of July, 2015. 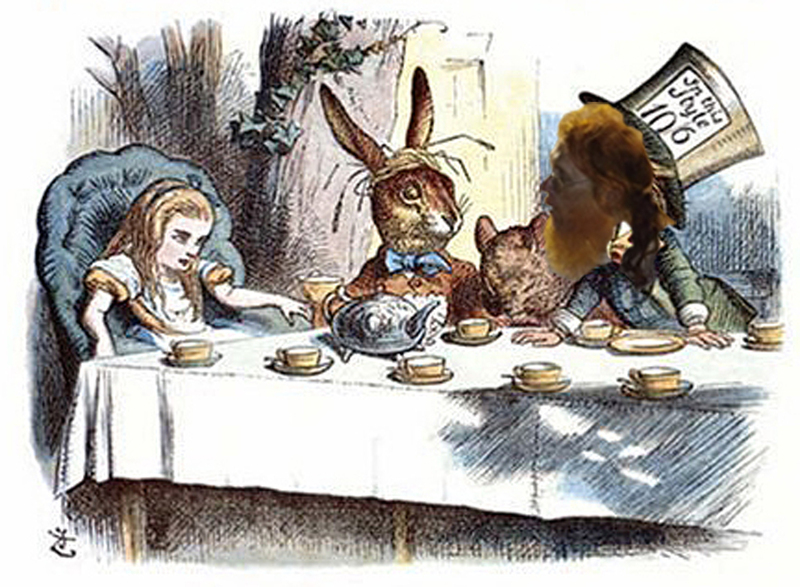 But – as you SHOULD know – the White Rabbit tends to arrive late to important events. Entries sent earlier will be looked at earlier. After that deadline, there’ll be a mad rush to make final decisions and set it all up for the printers in time for the party. At the party, first-edition [limited to 25 copies (most of which have already gone their own way), pre-ISBN, hand-sewn and signed by the author] copies of Not Now, Daddy! by Jimmy Hollis i Dickson will be auctioned in order to help cover expenses. Any amount left over – if any – will be going to good causes. A newer edition of this book – and our others – will be on sale at a slight discount. “How do you know I'm mad?” said I. 2) be suitable for a book to be read/seen by – among others – children. Another in the 3-way tie is – "Curiouser and curiouser!” – Through The Looking Glass (And What Alice Found There).